This page is an attempt to list all decals that were on Spitfires and GT6's and their proper placement. If a decal/badge does not have a link then I do not have enough information for correct location (under construction). "SCCA National Champion 1965, 68, 70, 71, 72, 73"
"Triumph Spitfire, Sports Car Club of America, National Road Racing Champion F-Production 1969 and 1970"
"Triumph GT6, Sports Car Club of America, National Road Racing Champion E-Production 1969 and 1970"
Square badge on bonnet next to bonnet latch. 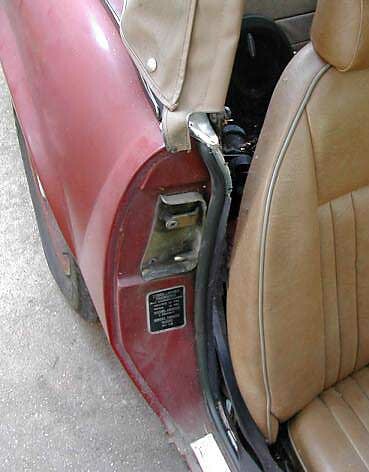 Fitted on both sides up to Oct. 1970-1975. 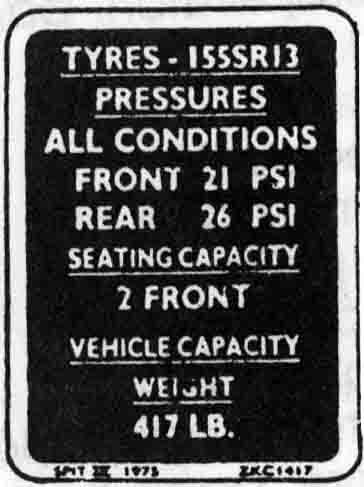 Oct.75-1976 on driver's side only. No longer fitted after 1976. Click here to download a vector file of this decal. Mk I-III used chrome individual letters across the leading edge of the bonnet. Placement dictated by factory drilled holes. Placement dictated by factory drilled holes. 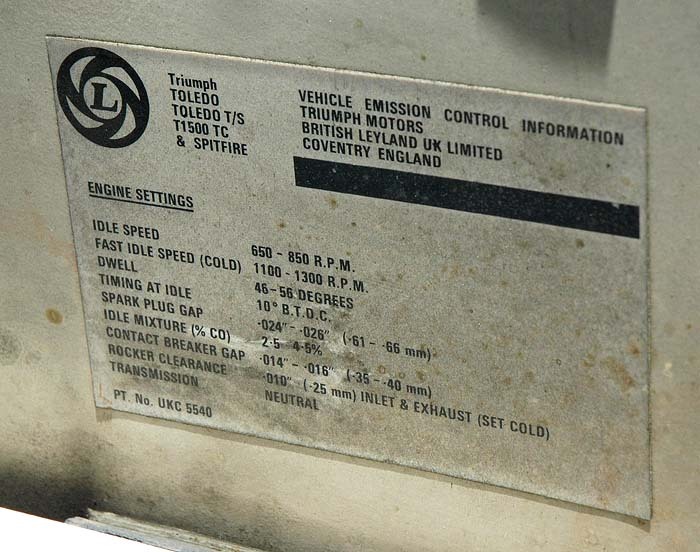 Rectangle decal describing emissions, tuning etc. 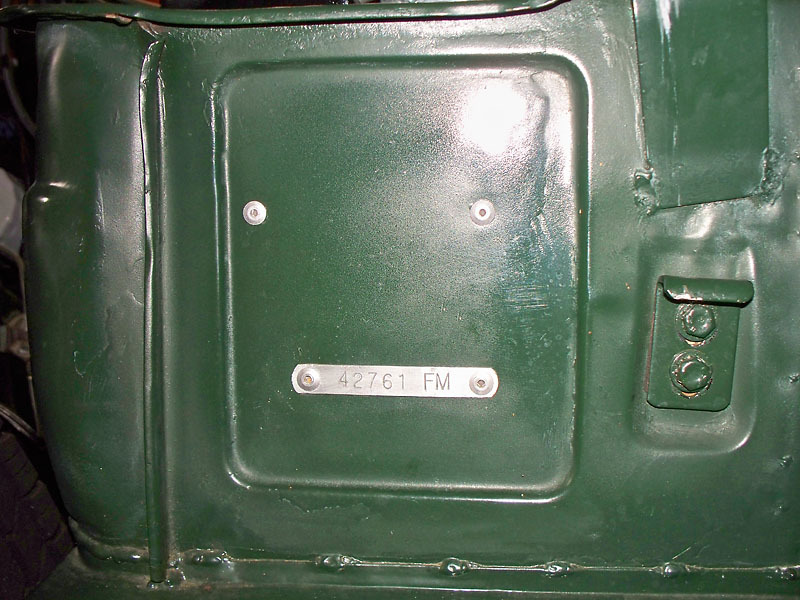 Square badge on bonnet next to bonnet latch. Fitted on driver's side. 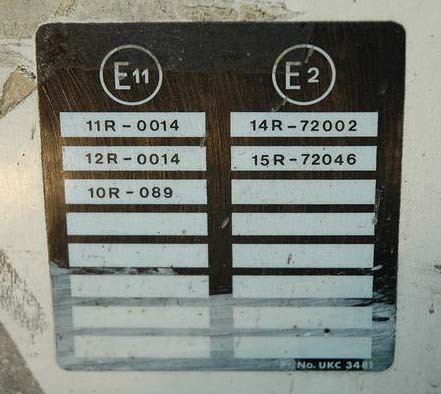 Black rectangular decal with white lettering fitted on left door post. "Vehicle emissions control information, This vehicle conforms to US E.P.A. 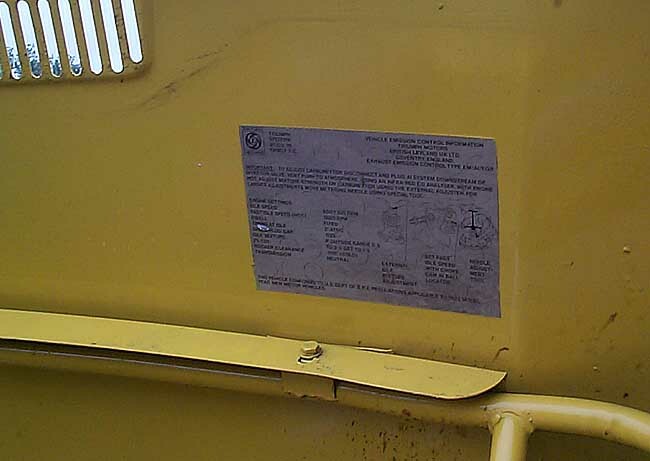 regulations applicable to 19XX model year new motor vehicles"
White rectangular decal with red lettering fitted on firewall behind battery. "When using boost start observe polarity of battery. 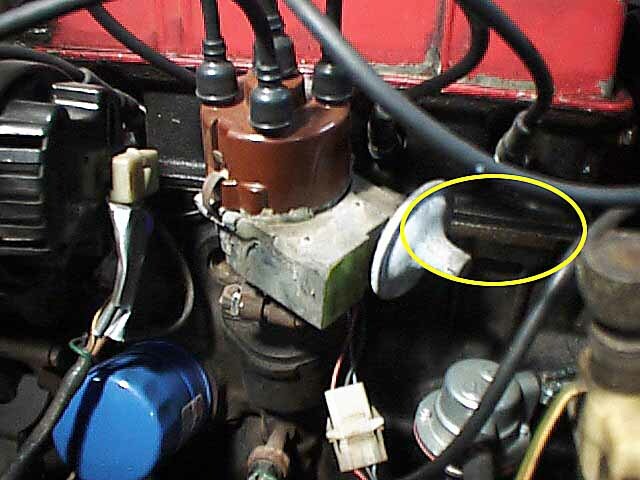 Supply voltage must not exceed 19V otherwise damage to the ignition will occur"
Early Plate: photo located here: photo. 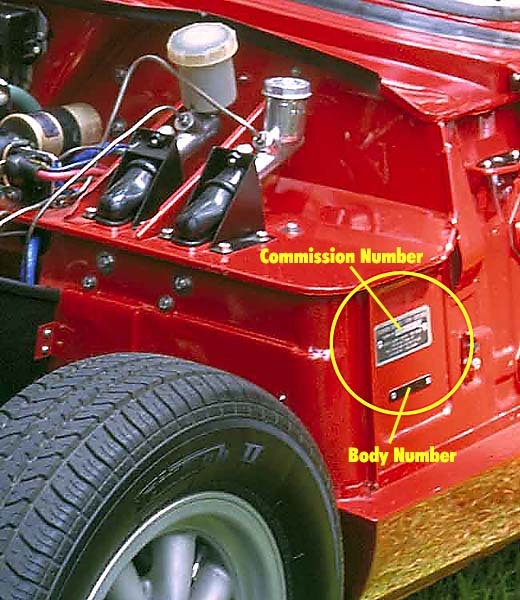 The Commission plate is most often located under the car's hood (bonnet) on left side of the body our inside the door jamb of US cars. This page discusses colors and locations of factory and non-factory stripes. Also shows other stripes and color schemes. Paul's page explaining how he cleaned his tarnished plaques. 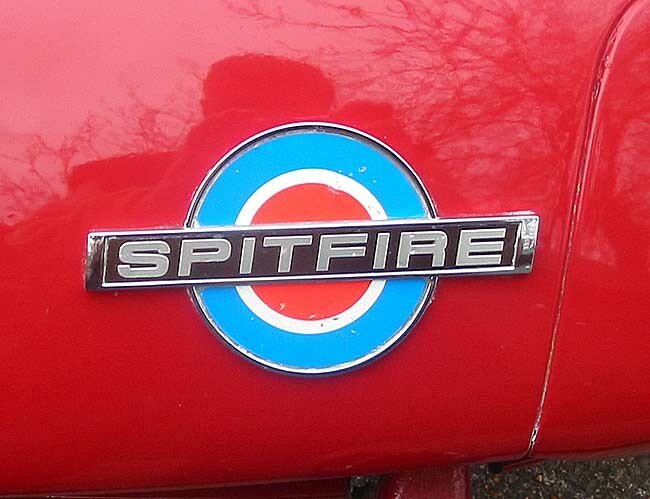 He also shows another SCCA National Champion plate on 1980 Spitfires. It has much larger lettering and dates of titles go to 1978. If you also have this plaque, let Paul know. This page shows ID plates that Rarebits4classics sells. 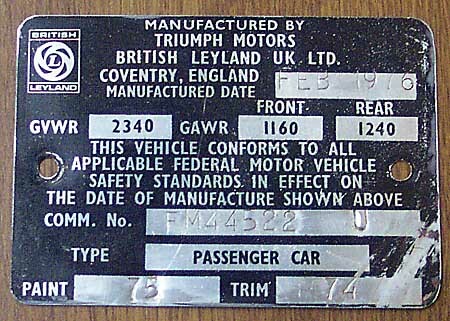 It shows close up photos of plates from 1958-68 of many Triumph models.